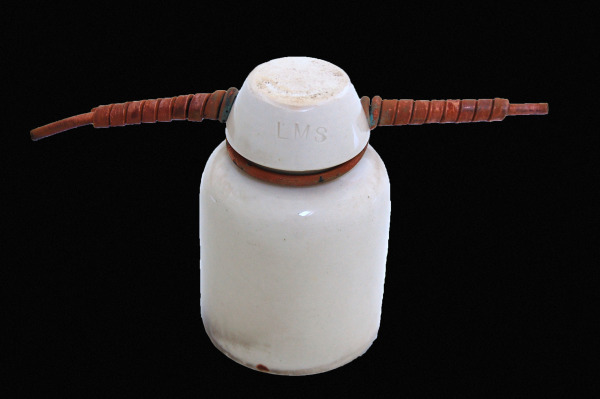 Porcelain LMS railway telegraph insulator. Photo by Daniel Wright [CC BY-NC-ND 2.0] I’ve enthused over the tactile properties of porcelain before, not least in the form of third rail insulators. The item above is an insulator too, although it’s a lot smaller (about 12cm tall). The copper wire is the clue; this is a railway telegraph insulator from the London Midland & Scottish Railway. According to the markings on its top, it is a model number 1, and was manufactured in 1941 by Bullers Ltd.
← First 2015 wagon projects near completion.